Available Styles: Lateral arm awning for patios, window awning, pergola. Applications: Intermittent shade for residential or commercial patios, windows and decks. Our Lateral Arm Awning System is available in two versions: The SUNAIR is top of the line with a 3:1 ratio beveled gear and double cables in each arm. The SUNSTAR is our less expensive unit, with a 7:1 ratio work gear and single cables in each arm. Fabric: The fabric canopy is fabricated with Sunbrella Awning Acrylic Canvas and is available in 64 solid styles and over 100 striped styles. Frame: The SUNAIR is available in Sand, White, Green, Brown, Silver or Mocha. The SUNSTAR is available in Sand and White. Sizes: Retractable Lateral Arm Awnings are available in widths up to 35′ and projections of up to 13′. Hinge: The hinge uses twin galvanized tinned steel cables over a specially engineered elliptical radius. The hinge is triple-angled. Powder coating: All components and extrusions are electro-statically powder coated to the highest standards, producing an extremely attractive, durable coating which is resistant to cracking and peeling. Hood and Endcaps: The lateral arm awning is available with a hood system with an integrated drainage channel at the leading edge of the hood and finished with a designer hood endcap. The Pergola is a motorized system meant for larger areas such as commercial restaurants or cafe, or a large residential patio. This system offers the durability of a stationary awning with the convenience of a retractable awning. Frame: The pergola is available in Sand, White, Green, brown, Silver or Mocha. Sizes: The maximum width per awning is 14′ and the maximum stress projection is 20′. Larger areas can be covered by coupling units together. Retractable window awnings are designed for residential and commercial applications and extend down to 160 degrees. 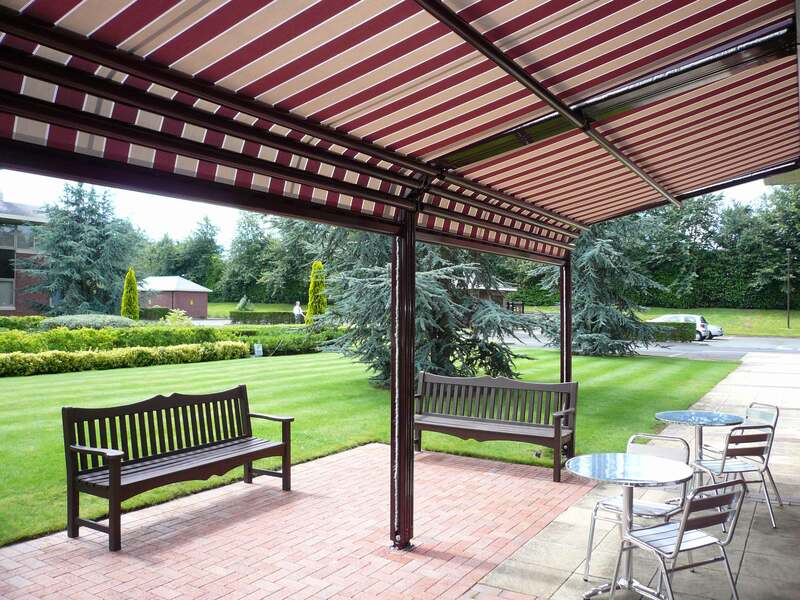 Frame: The window awning is available in Sand, White, Green, brown, Silver or Mocha. 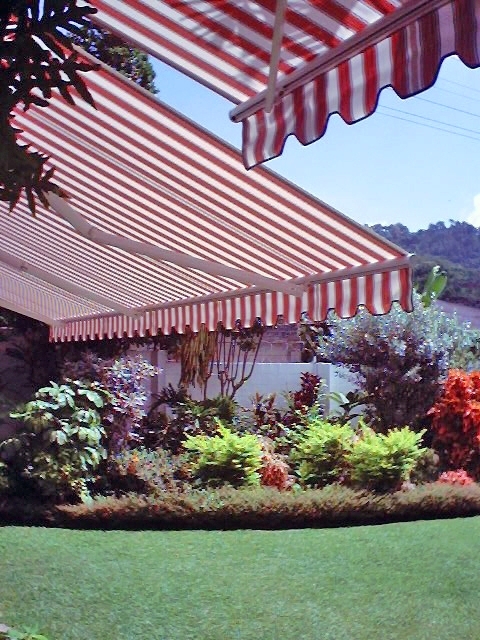 Sizes: These awnings range from 4′ to 30′, with a maximum projection of 5’8″. When measuring the size for the projection, take the view from the window into consideration. When the awning is extended in normal position, the view should not be obstructed. The projection of the awning should be equal to half the height of the window. Operation: Manual gear operation is standard, while hood and motors are optional. The system uses the same roller tube and front bar as our lateral arm systems. Arms: The arm is designed with a heavy-duty internal spring system.